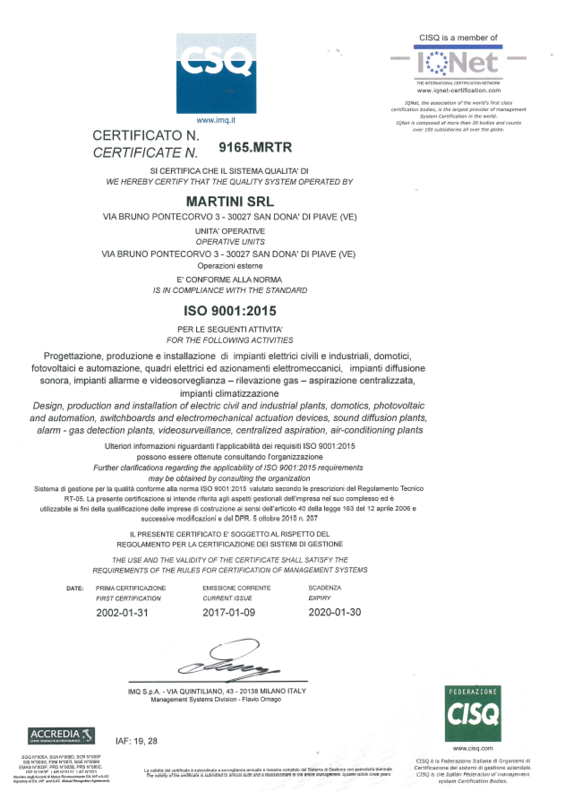 Company certifications and professionalism - Martini S.r.l. 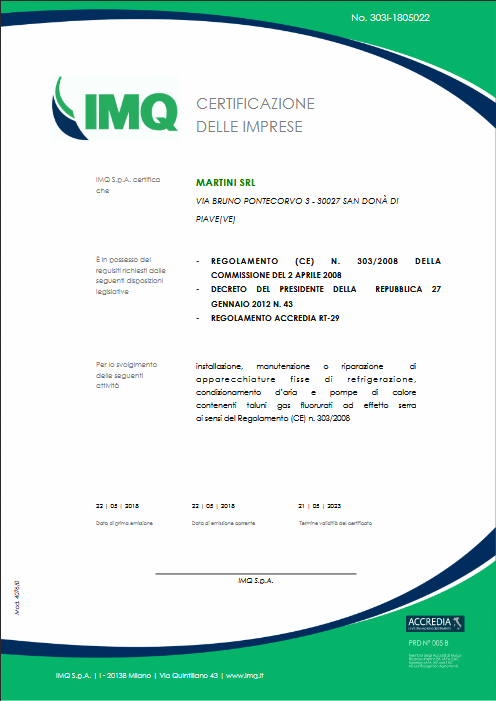 In 2002 we obtained the Quality Management System Certification issued by CSQ (Certificate no.6554), and today we intend to keep, and where and when possible to improve, the current quality features of our system in order to keep our position on the high-end portion of the market; from here the decision to adjust the Quality Management System to the UNI EN ISO 9001: 2008 standard. It is very important for us to be known in depth by all our partners and customers, and that everyone understands that behind every product there is a constant commitment of all company components, a working culture that aims at always giving the best. The staff members perform their works responsibly, observe precise instructions and check the quality of the products/services to ensure customer satisfaction. With this brief company profile, we hope we won our personal “challenge” with the simplicity, fairness and enthusiasm that have always characterized us. 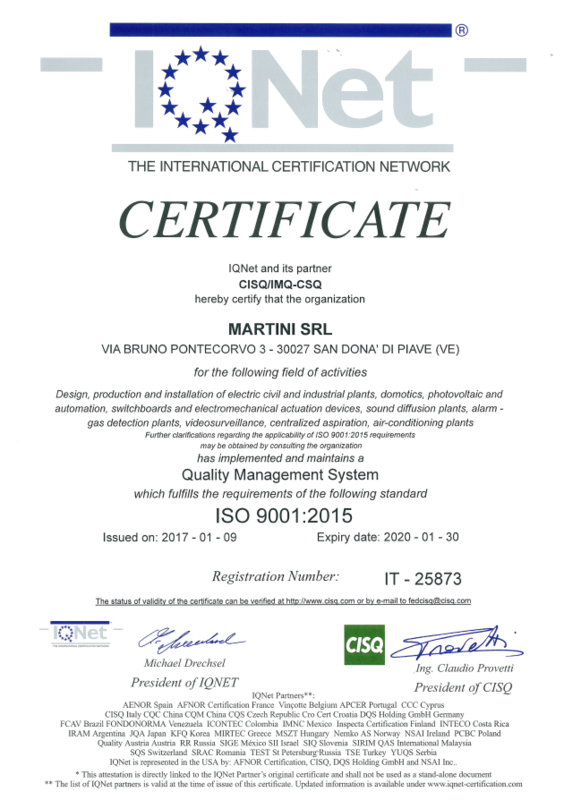 In January 2017 we adjusted the Quality Management System according to the UNI EN ISO 9001: 2015 standard. In 2017 we obtained the Occupational Health and Safety Management System Certification issued by DNV-GL (Certificate No. 238798/2017). We are convinced that health and safety in the workplace is something everyone should commit to, and it doesn’t mean only keep a safe and correct behavior while carrying out the tasks, but also constantly try to create the most suitable conditions to make it happen. Sharing this belief with all the staff is fundamental. The company management hardly worked to define an appropriate S.G.S.S. 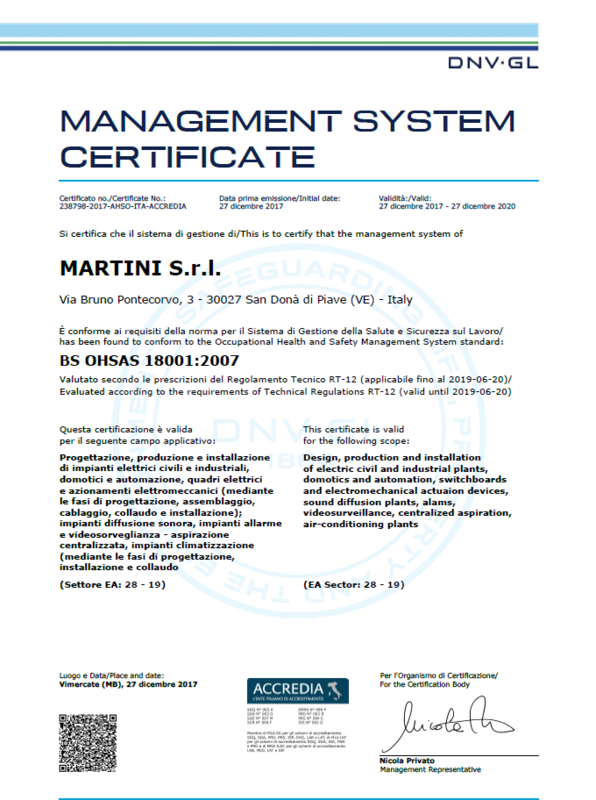 to ensure that every worker is aware of the importance of compliance with security policy, procedures, requirements of the health and safety management system, individual obligations when it comes to safety, consequences, personal and other workers safety, and benefits that come with an improvement in individual performance. Therefore the company management commits to comply with current regulation in terms of health and safety in the workplace and its continuous updated, and to make available all the human, material, financial and instrumental resources necessary for the maintenance of the system. 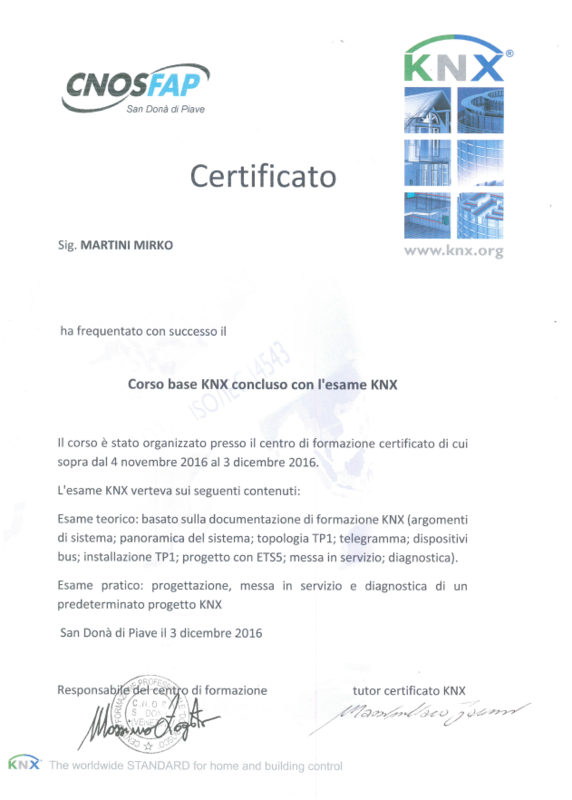 In 2016 our technicians attended the advanced home automation course and obtained the certification for KNX systems (KONNEX). KNX is an open worldwide standard for home and building automation that gives you control over lighting heating/cooling, anti-intrusion, video surveillance, video intercom, etc.. In May 2018 our technicians have obtained the FGAS certification with IMQ (certificate no. 303I-1805022), as required by current regulation for companies operating in air-conditioning field.